1. What is a Standard ? A Standard is document established by consensus and approved by a recognized body, that provides, for common and repeated use, rules, guidelines or characteristics for activities or their results, aimed at the achievement of the optimum degree of order in a given context. 2. What are National Standards ? 3. What are Regional Standards? 4. What are International Standards ? 5. How are National Standards Developed? The work of formulation of standards on any specific subject shall be undertaken when the Division Council concerned is satisfied as a result of its own deliberations or on investigation and consultation with concerned interests that the necessity for standardization has been established. When the subject has been so investigated and the need established, the Division Council concerned shall assign the task of formulating the standard to an appropriate Technical Committee or shall appoint a new Technical Committee for the purpose. When request for establishing a standard for any specific subject has not been accepted after its due consideration, the proposer is informed of the decision. A draft standard prepared and duly approved by a Committee is issued in draft form and widely circulated for a period of not less than one month amongst the various interests concerned for critical review and suggestions for improvement. The wide circulation may be waived if so decided by the Sectional Committee where the matter is urgent or non-controversial. Special attention is given to multidisciplinary areas such as energy conservation, environmental protection, rural development and safety. The appropriate Technical Committee thereafter finalizes the draft standard giving due consideration to the comments that may be received. 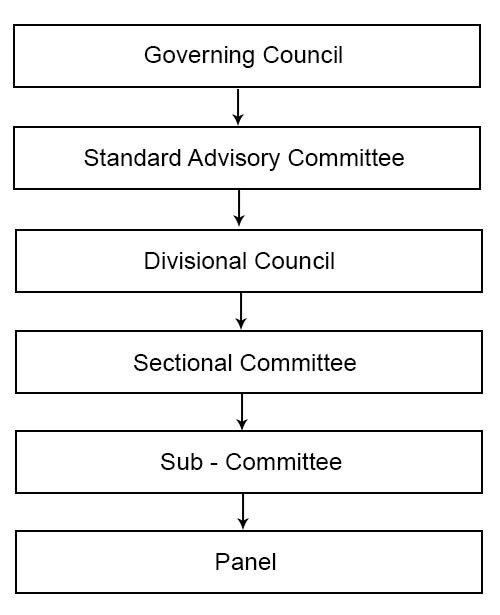 The draft standard after it has been approved by the Sectional Committee and submitted to the Chairman of the Division Council concerned for adoption on its behalf. 6. What types of Standards are developed by BIS? 7. What are the key principles in standard development? 8. What is the organisational Structure in respect of National Standard development? 9. How BIS aims at having a balance approach by involving stakeholders in standardization process? While developing Indian Standards, technical committee has representation from Manufacturers, Consumer, Govt. departments, Technologists, Regulating Authorities, Testing Laboratories, Consultants, Universities and Other Experts etc. It is ensured that the consumer interest shall predominate in the committee and the standards are developed on consensus principle. 10. Which are the other Standard Development Organizations in India ? 11. Who can propose the need for development of new standard ? What is the procedure? Any person, being a Ministry of the Central Government, State Government, Union territory administration, consumer organisation, industrial unit, industry-association, professional body, member of the Governing Council, member of a technical committee or any individual who proposes for establishment of an Indian Standard or for amending or for revising or withdrawing an established Indian Standard may submit the proposal to the Bureau in writing for the purpose. 12. What is the procedure for proposing a new subject for development of National Standard? Please submit the proposal in the prescribed Performa. 13. What are the benefits of standards? 14. How are Indian Standards reviewed & updated ? All established standards are reviewed periodically, at least once in five years, to determine the need for revision or withdrawal. Standards which in the opinion of the Sectional Committee need no revision or amendment are reaffirmed by the Sectional Committee. 15. How one can comment on Indian standard ? Indian Standards are dynamic in nature and are periodically reviewed by BIS. However in case any stakeholder desires to make any comment on the Indian Standard, the same can be submitted through the prescribed Performa. 16. How do BIS participate in International Standards Development Process?